Ugandan lawmakers fight in the parliament ahead of a debate about amending the constitution to possibly extend the president's rule in Kampala, Uganda, on September 26. 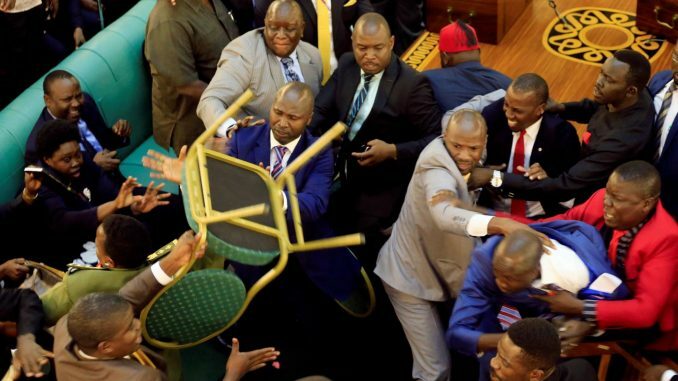 In recent days in Uganda, fisticuffs have been a mainstay of parliament as lawmakers debated changing the constitution to remove an age limit on presidential candidates. The issue has sparked tensions in the East African country, where President Yoweri Museveni has been in charge since 1986. Museveni, 73, won another five-year term in 2016, but under the current constitution—which bars presidential candidates over the age of 75 from running—he would not be able to seek re-election in 2021. Lawmakers from Museveni’s ruling National Resistance Movement have proposed a constitutional amendment that would lift the age cap on presidential candidates. But opposition politicians, rights activists and even some members of Museveni’s party have criticized the measure. Violence broke out in the Ugandan parliament in the capital Kampala on Tuesday as a motion authorizing parliament to draft a bill lifting the age limit was presented. The speaker had some 25 MPs forcibly ejected for fighting on Tuesday, which led to other like-minded MPs leaving the chamber, Reuters reported. But fighting broke out again when parliamentarians returned to the house on Wednesday. Lawmakers threw chairs, used microphone stands as makeshift weapons and brawled on top of the seats in the house. At least two female MPs had to be removed from the chamber after collapsing, a Reuters journalist on the scene reported. Many of those opposed to removing the age limit wore red hats or headbands, a symbol of resistance to the constitutional amendment. Museveni has not commented publicly on the violence, which sparked a range of reactions on social media. Opposition leader Kizza Besigye accused Museveni, known as M7 in Uganda, and House Speaker Rebecca Kadaga of “burying” the Ugandan parliament. Others reacted with a mixture of humor and dismay. The debate about removing the age cap for presidential candidates has become militarized; police and military personnel have been deployed around parliament and parts of Kampala since last week. Opposition figures say that the use of force, including tear gas on protesters demonstrating against the measure, is an attempt to shut down any debate around the issue. Uganda has seen decades of sustained economic growth under Museveni’s rule and has welcomed more than 1 million refugees from neighboring South Sudan, where civil war is raging. 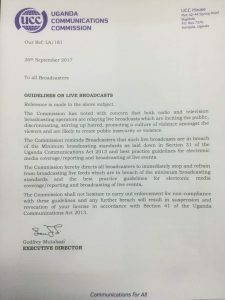 But Museveni has been accused of orchestrating human rights abuses by security forces and cracking down on freedom of speech, particularly around the 2016 election, when social media was temporarily blocked and Besigye, the main opposition candidate, was arrested on multiple occasions.